Queen Kunti is a major figure in the history of the ancient world. The wife of world emperor Pandu and mother of the warrior Arjuna—to whom Krishna spoke the Bhagavad-gita—she appears again and again in historical epics such as the Mahabharata and Srimad-Bhagavatam. Like other enlightened leaders of her time, her worldview was informed by thorough understanding of Vedic wisdom literature. Thus she understood that Krishna—Who happened to be her nephew—was none other than the Absolute Truth in person, appearing on earth to establish righteous rule over the planet. At the conclusion of the devastating battle of Kurukshetra, Queen Kunti approaches Krishna as He prepares to depart for his home city of Dwaraka. Kunti's spontaneous glorification of Krishna and her description of the spiritual path appear in the First Canto of the Srimad-Bhagavatam (1.8.18-43). Srila Prabhupada wrote his translation and commentary on the First Canto in 1962—before coming to the West—but in a series of lectures given in the spring of 1973 in Los Angeles, he analyzed Queen Kunti's prayers in significantly greater detail and shed even more light upon them. 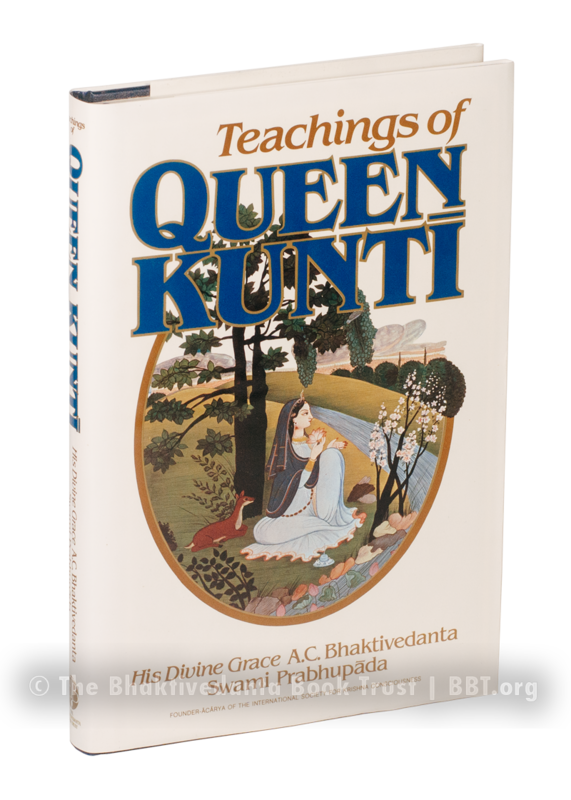 Teachings of Queen Kunti was published to the same scholarly standards as Srila Prabhupada's Srimad-Bhagavatam and Bhagavad-gita As It Is; with original devanagari Sanskrit text, roman transliteration, word-for-word English translation, elaborate commentary, as well as further explanations of the verses compiled from his 1973 lectures.